Bin Laden is Dead But What about the other Issues? Cheer! Yay! Go Team! Yes, it’s done…OSama Bin Laden is Dead, but now what? Gas is Still over $5 a gallon in some places…the economy is busted…the Jobless are losing hope. But it’s super-awesome we spent $millions and $billions in time, resources and manpower chasing, cornering, studying and finally executing one man. 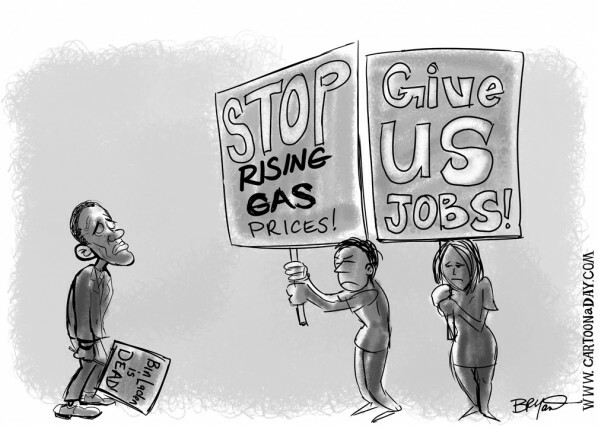 Inspiration: A Funny cartoon a day featuring President Obama and Protestors. The President sees his outlook as glum.